Consider whether the child is really a picky eater or just a light eater. Don’t compare amount eaten by a 3-year old with amounts eaten by a child who is only 1- 1/2 years old. Focus less on what a child eats at a particular meal or snack, and look at foods eaten over several days. 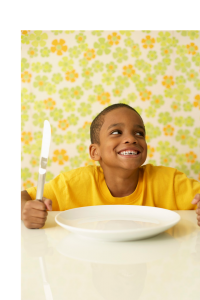 Research shows that if a child eats less at one meal, he will balance his intake by eating more later on in the day. Recognize that appetite varies from meal to meal, and day to day. Prior to growth spurts, appetite increases; prior to the onset of an illness, appetite may decrease. Don’t push a child to take “just one more bite” in order to please you. Children naturally learn to respect their own feelings of hunger, unless you confuse them. Remember that a young child may have strong feelings about certain textures, flavors, consistencies and even colors. This child will take longer to accept new foods. Children’s tastes change over time, so reintroduce foods every few weeks. Don’t use food as a reward, punishment or pacifier. Don’t place special significance on dessert. If served, it should be part of the meal and offered to all children, without expecting them to earn it by cleaning their plates. Serve small portions so that the child is not overwhelmed by the quantity of food on the plate. Remember that when a child rejects your food, he is not rejecting you. Making mealtime a battleground can greatly affect a child’s relationship with food. Why not make peace with your picky eater? A more relaxed attitude will help shape healthy eating habits for a lifetime.